Is there a better alternative to Aztec Calendar? Is Aztec Calendar really the best app in Screen Savers category? Will Aztec Calendar work good on macOS 10.13.4? 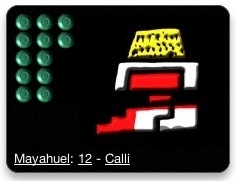 The Aztec Calendar widget displays the symbols for the day in the 260-day year of the Aztec Calendar, the tonalpohualli. For Aztecs, the tonalpohualli tells us how time is divided among opposing supernatural forces. In addition to the symbolic representation of the day, the name of the protector of the 13-day period is presented. More information on the specific quality of the day can be found by clicking the links in the widget. Version 1.11: Minor usability changes. Aztec Calendar needs a review. Be the first to review this app and get the discussion started! Aztec Calendar needs a rating. Be the first to rate this app and get the discussion started!